Dza Patrul Rinpoche (Tib. རྫ་དཔལ་སྤྲུལ་རིན་པོ་ཆེ་, Wyl. rdza dpal sprul rin po che) aka Orgyen Jikmé Chökyi Wangpo (ཨོ་རྒྱན་འཇིགས་མེད་ཆོས་ཀྱི་དབང་པོ་, o rgyan 'jigs med chos kyi dbang po) (1808-1887) — an enlightened master, who, though he lived the life of a vagabond, was one of the most illustrious spiritual teachers of the nineteenth century. His principal teacher was Jikmé Gyalwé Nyugu, a great master who was one of the foremost students of Jikmé Lingpa. 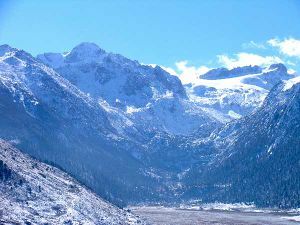 From Jikmé Gyalwé Nyugu he received no less than twenty five times the teachings on the preliminary practices of the Longchen Nyingtik, as well as many other important transmissions. From time to time he would write a text of his own and these treatises were later collected into six volumes of his writings. Among them is The Words of My Perfect Teacher, Kunzang Lama’i Shyalung. Statue of Patrul Rinpoche, according to Matthieu Ricard. Dza Palge Tulku or Dzogchen Patrul Rinpoche was born in the Earth Dragon year of the fourteenth calendrical cycle in Getse Dzachukha, in the nomadic area of northern Kham, to a family with the name of Gyaltok. 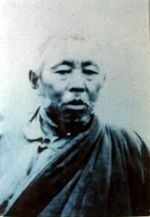 He was recognized by Dodrupchen Jikmé Trinlé Özer as the incarnation of Palgé Samten Phuntsok and was given the name Orgyen Jikmé Chökyi Wangpo. At an early age, he learned to read and write without any difficulty. He took ordination with Khen Sherab Zangpo. With Dola Jikmé Kalzang, Jikmé Ngotsar, Gyalsé Shenpen Thayé and other teachers, he studied the Trilogy of Finding Comfort and Ease, The Way of the Bodhisattva, Secret Essence Tantra and many other works related to sutra and tantra, as well as the ordinary sciences. From Shechen Öntrul Thutob Namgyal, he received the reading transmission for the Translated Word of the Buddha (Kangyur) and teachings on Sanskrit grammar. He received the transmissions for the Kangyur and Tengyur in their entirety, together with the excellent writings of the omniscient father and son of the Nyingma tradition, as well as the works of Sakya Pandita, Lord Tsongkhapa, and many other great masters of the old and new translation schools, and by studying and reflecting on them with diligence and persistence and without any sectarian bias, he attained a perfect level of scholarship. Not only did he receive instruction on the Longchen Nyingtik preliminaries some twenty-five times from Jikmé Gyalwé Nyugu, he completed the required practices the same number of times. In addition, he received instruction on tsa-lung practice and Dzogchen, and studied many of the cycles of practice found in the canonical scriptures (kama) of the Nyingma school. Do Khyentse Yeshe Dorje introduced him directly to the pure awareness of rigpa while exhibiting wild and eccentric behaviour. He trained for a long time in the Longchen Nyingtik tsa-lung practices, and he received immense amounts of nectar-like Dharma from Dzogchen Rinpoche Mingyur Namkhé Dorje and other masters. 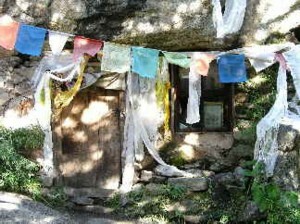 While dwelling for long periods near Dzogchen Monastery in the isolated hermitages of Rudam, such as the Yamantaka cave and the Long Life cave, he put all his energy into the practice of meditation and attained a realization that was as vast as space. From the age of thirty, he travelled to Serthar, Yarlung Pemakö and other places, teaching extensively on the Secret Essence Tantra to gatherings of fortunate vidyadharas. To assemblies in Serthar and in the upper and lower regions of the Do valley he bestowed countless gifts of the Dharma, teaching on The Way of the Bodhisattva, Mani Kabum, Aspiration Prayer of Sukhavati and so on. He put an end to robbery and banditry and abolished the custom of serving meat at special gatherings. He went to Dzamthang and studied the Six Yogas with Tsangpa Ngawang Chöjor, and he went to Minyak, where he had extensive discussions with Dra Geshe Tsultrim Namgyal on the prajnaparamita and other topics. In this way, he went about as a renunciate, having abandoned all worldly concerns, and worked impartially for the sake of others, without any fixed agenda or itinerary. Shantideva, author of the Bodhicharyavatara. Patrul was regarded as his emanation. When Tertön Chokgyur Dechen Lingpa took the terma of Demchok Sangye Nyamjor from Rudam Kangtrö, the snow hermitage at Dzogchen, he appointed Patrul Rinpoche as the custodian of this and other cycles, including The Heart Essence of the Three Families (Tib. Riksum Nyingtik), and offered him all the necessary empowerments, reading transmissions and instructions. He established a teaching centre in the vicinity of Dzagyal Monastery. When repairing the great complex of walls of ‘mani’ stones (do-bum) built by his previous incarnation Palge Samten Phuntsok, it became exceedingly beautiful and even bigger and taller than before, and thereafter became known as the Patrul Dobum. Patrul Rinpoche composed countless works to suit the individual minds of his disciples and fulfil their aspirations, and although they cherished these and kept them for themselves, they were not collected by the master himself or by his attendants, and thus many of them were never carved into printing blocks. Those which were printed and which are now to be found, like nectar upon which we might feast our eyes, comprise volumes equal in number to the six paramitas. Amongst these compositions, we find all manner of works, including commentaries on and structural outlines (Wyl. 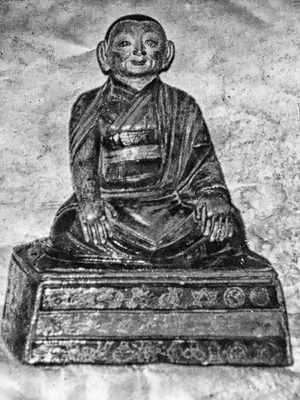 sa bcad) for the treatises of Maitreya, The Way of the Bodhisattva, Treasury of Precious Qualities and other texts, profound crucial instructions for guiding students experientially, such as The Words of My Perfect Teacher, collections of advice and miscellaneous writings including The Drama in the Lotus Garden, collections of praises and so on. In all that he wrote, he never went into excessive detail simply to show off his knowledge, but explained things in order to fit the capacity of students. The chief disciples of this great master who did so much to preserve and spread the teachings of the vajra essence of clear light included such learned and accomplished masters of the Nyingma school as Kathok Situ Choktrul Chökyi Lodrö, the Fifth Dzogchen Rinpoche Thupten Chökyi Dorje, Gyarong Namtrul Kunzang Thekchok Dorje, the second and third Dodrupchens, Jikmé Puntsok Jungné and Jikmé Tenpe Nyima, Dechen Rigpé Raldri, who was the son of Do Khyentse Yeshe Dorje, the supreme incarnation Shenpen Chökyi Nangwa [i.e., Khenpo Shenga], Adzom Druktrul Droddul Dorje, Tertön Sogyal Lerab Lingpa, Ju Mipham Namgyal, Khenchen Pema Damchö Özer [aka Khenpo Pema Vajra], Nyoshul Lungtok, Alak Dongak Gyatso and others. In addition, his disciples included many great masters and holders of the teachings of the Sakya, Gelug and Kagyü schools, such as Sershul Lharampa Thubten, Palpung Lama Tashi Özer and Ju Lama Drakpa Gyaltsen. According to Matthieu Ricard, this is a photo of Patrul Namkha Jikmé, one of the sons of Dudjom Lingpa, not of Patrul Rinpoche himself. This is in line with Orgyen Tobgyal Rinpoche who said that when this same photo was shown to Dilgo Khyentse Rinpoche he said that "it is not Patrul Rinpoche himself, but one of his incarnations". ↑ Longchen Rabjam and Jikmé Lingpa. ↑ In other words, he completed some two and a half million prostrations, and the same number of hundred syllable mantras, mandala offerings and repetitions of the Seven Line Prayer. Few masters in Tibetan history have accomplished such a feat. Two notable exceptions are the great Jé Tsongkhapa, who famously completed three and a half million prostrations and approximately ten million mandala offerings, and, in more recent times, the Sakya master Gatön Ngawang Lekpa, who accumulated a vast number of prostrations and other practices during his fifteen years of strict retreat. ↑ Some of his reincarnations were recognized in: Changma Khen Rinpoche Thubten Chöpel (according to the fifth Drubwang Dzogchen); Tsö Patrul of Repkong; Patrul Namkha Jikmé of Dzachukha (1888-1960), one of Dudjom Lingpa's sons; Jikmé Wangpo of Dzagya Gön; and Pöpa Tulku (according to Yukhok Chatralwa Chöying Rangdrol). ↑ Nyoshul Khen Rinpoche mentions in A Marvelous Garland of Rare Gems that Patrul Rinpoche had four principal students who were more learned than himself: 1) Nyoshul Lungtok who surpassed his master with respect to the view, 2) Tendzin Drakpa who was more learned in logical reasoning (pramana), 3) Minyak Kunzang Sönam aka Thubten Chökyi Drakpa who surpassed his master in conduct, and 4) Orgyen Tendzin Norbu who was even greater than Patrul Rinpoche in explaining the teachings. Nyoshul Khenpo, A Marvelous Garland of Rare Gems: Biographies of Masters of Awareness in the Dzogchen Lineage, Padma Publications, 2005, pages 223-238. Tulku Thondup, Masters of Meditation and Miracles, edited by Harold Talbott (Boston: Shambhala, 1996), pages 201-210. This page was last edited on 4 September 2018, at 08:06.